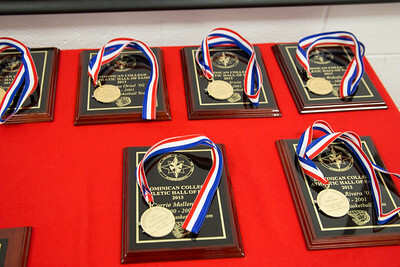 The Athletic Hall of Fame honors individuals who have earned high levels of success in athletics at Dominican College. Since its inception in 1995, the Alumni Athletic Hall of Fame has acknowledged and honored individuals who have earned high levels of success in athletics at Dominican College, either as an athlete, coach or supporter, and who have demonstrated commitment, leadership, team spirit and excellence in athletics. The purpose of the Athletic Hall of Fame is to recognize the accomplishments of the College’s greatest athletes, coaches and members of the College community to bring honor and distinction to Dominican College, and to support in all ways possible the College’s intercollegiate athletics programs. Individual alumni, coaches, entire teams, and administrators/staff are eligible for induction. Members of the Athletic Hall of Fame are futher honored by having a plaque with their name and picture on permanent display in the Hennessy Center.